Happy Quilting: Threadology Quilt Along Stars Today!!! 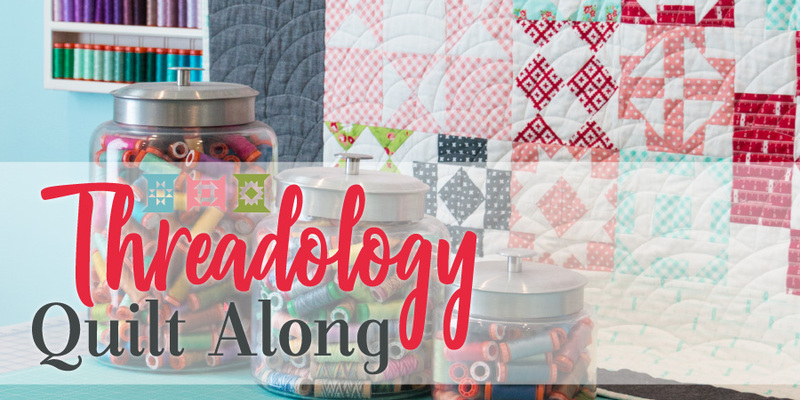 The Fat Quarter Shop's annual Charity Quilt along, stars today and this year has us making awesome patchwork blocks in two sizes for the Threadology Quilt !!! I am so super excited. This year the Quilt Along will benefit the Make a Wish Foundation . I just love this quilt along and how great it is to be quilting for such an amazing cause!!! And each year when I finish my Charity Quilt along quilt, I donate it to the Festival of Trees fundraiser in honor of my sweet little nephew David . So it just doubles the great causes, and makes it all the more awesome!!! Today the fabric requirements are being released. If you want yours to look like the original above, you can order a Threadology Quilt Along Kits which comes with half yards in Bonnie and Camille's adorable new Little Snippets line as well as some bonuses like Aurifil thread, the full pattern (so you can work ahead if you like) and keepsake box with a magnetic closure . I totally love Bonnie and Camille fabrics, but figured I best use some of my stash, since I have quite a few bundles stacking up ;) So my plan is to use some Handmade, Hello Darling, Little Ruby, and a bit of Daysail. It's going to be so fun picking out which fabrics to use each month!!! I love the layout you are planning on making! I love your spin on it! Know I'm considering joining you. I wasn't sure about the spool layout (as cute as it is) as well. Melissa, this is going to be such a fun quilt. Beautiful fabrics! I'm so sorry I just commented on an old post. I failed to look at the date.